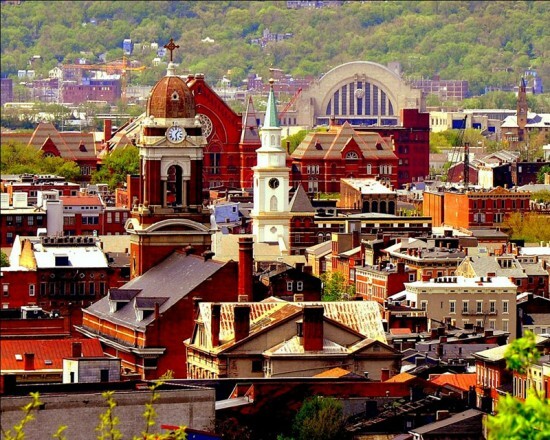 Dear readers, Eavesdrop had the opportunity to explore Louisville, KY—our hometown—and Cincinnati, OH (a.k.a. Porkopolis) over the weekend. It’s been six or seven years since our last trip to Cincy and we have a couple things to say about it. It’s kind of a real city, like dense and old, with just enough corporate headquarters looming over the skyline. We finally got to see the HOK designed Great American Tower in real life and it’s just as bad in person as its renderings. You may remember that we thoroughly made fun of its fugly, Princess Di inspired, steel tiara—something about lipstick on a pig. Let’s update that to a more current comparison. That tiara is more Honey Boo Boo than Princess Di. Eavesdrop is not a fan of hats or tiaras on buildings—i.e. the Pappageorge Haymes-designed One Museum Park in Chicago with its sailor cap. The American Institute of Steel Construction disagrees, recently giving said tiara a design award. Cincy’s little sibling across the river, Covington, KY, has its own shiny shocker: Daniel Libeskind’s Ascent at Roebling Bridge, which is essentially a nautilus that mated with a Vegas hotel that was birthed onto the banks of the Ohio. And–just announced!–Covington is so hip that they’re turning their 102-year old City Hall into a boutique hotel. Despite a few eyesores, things in downtown Cincy are definitely looking up. The Over-the-Rhine neighborhood was shockingly vibrant in a way that should make Louisville’s NULU district extremely jealous. Louisville could use its own version of 3CDC, Cincinnati Center City Development Corporation, whose name adorned many banners and reconstruction projects. In Louisville there was nary a person walking the streets of East Market, NULU’s main drag. Cincy, please send some of that development juice downstream! 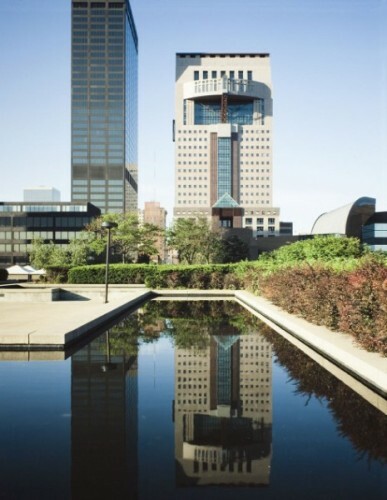 Blair Kamin seems to have joined the reconsider PoMo chorus, stating in his Sunday column that the movement “deserves a more sophisticated reappraisal.” The focus of the Tribune tribute was Michael Graves’s Humana building in Louisville, Kentucky. By drawing comparisons to Johnson’s AT&T building in its unabashed commercialism and to Kohn Pedersen Fox’s 333 Wacker Drive for its national significance, Kamin writes that “Graves crafted a tower that could only have been built in Louisville.” The reassessment comes on the heel of Graves receiving the Richard H. Driehaus Prize for classical and traditional architecture in Chicago last month, which in turn came after last fall's PoMo Conference at New York’s Institute for Classical Architecture and Art. Seems that the classicists are going gaga for PoMo. When Jeanne Gang was brought on board in April to help reimagine a stalled tower in downtown Lexington, Kentucky, the entire community's spirits were uplifted by the bold collaboration proposed by the Chicago-based architect and MacArthur genius. Studio Gang's design replaced an uninspired high-rise block that destroyed an entire city block before running out of steam, but developer Dudley Webb announced Thursday that Gang will no longer be involved with the mixed-use project. Studio Gang's proposal called for a 30-story tower of bundled tubes anchoring one corner housing a small hotel and residences and an 8-story crystalline office tower on the opposite side. In between, smaller structures to be designed by five local firms were situated around green space and organized with a cellular ground plan. Michael Speaks, Dean of the College of Architecture at the University of Kentucky was disappointed by the news that Studio Gang would no longer be involved. "I assumed, like I think a lot of people, Studio Gang had been hired to do the whole thing," he told the Lexington Herald-Leader. "My impression is that Jeanne thought they were going to do the whole project, too." Webb said the bundled tower was among the challenges that wouldn't work for the project. Plans for a boutique hotel fell through, so the developer reverted to original plans for a much larger J.W. Marriott convention hotel. Webb told the Herald-Leader that Marriott will only work with architects who have previously designed convention hotels, a project type Studio Gang hasn't undertaken. Jeanne Gang had expressed interest in working with an architect from Marriott to move the project forward. Now, EOP Architects, one of the five local firms brought on board by Gang to work on the project, will work to redesign the larger hotel and its accompanying 10,000 square foot ballroom and fit it into Studio Gang's master plan. Lexington Mayor Jim Gray, who was influential in bringing Studio Gang on board in the first place, suggested the city should insist on a design that won't compromise Gang's original vision. Developer Dudley Webb of the Webb Companies didn't make any friends when his company razed an entire block of Downtown Lexington, Kentucky for a massive mixed-use tower that ended up stalling in the recession. Now, though, after bringing on Chicago-based Studio Gang to help reimagine the project at the behest of Lexington Mayor Jim Gray and dean of the University of Kentucky College of Design Michael Speaks, the community is regaining excitement over new plans to revamp the CentrePointe site. Jeanne Gang, principal at Studio Gang, took to the stage today to present her latest plans for the CentrePointe site and to announce a team of five Lexington-based architects (chosen from a pool of 25 applicants) who will collaborate on the project to offer variety and local character. The selected firms include: David Biagi, Architect; CSC Design Group; EOP Architects; OMNI Architects; and Ross Tarrant Architects with Pohl Rosa Pohl. The focal point of the design is a 30-story tower of "bundled tubes" housing a hotel, apartments, and condos. 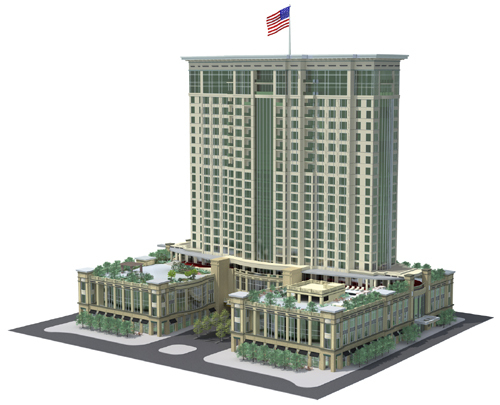 The tower is similar to a concept massing model presented in early June, and features patterning reminiscent of traditional horse farm fencing common around Lexington. Gang told the Lexington Herald-Leader, "The benefit of the tubes is you can go inside and on top of them and have public spaces." 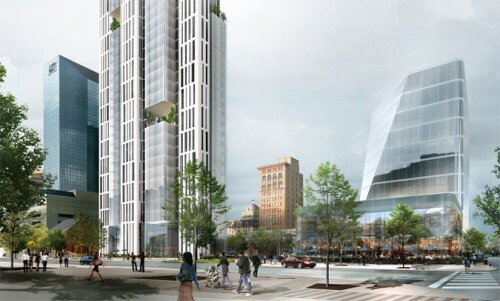 Renderings show landscaped voids where the vertical tubes are separated as they rise to maximize air flow and sunlight hitting the building. Adjacent to the tower is an 8-story glass shard office building. Connecting the two larger buildings are a series of smaller scale structures to be designed by local architects. Studio Gang studied the topography of Lexington's equine landscape including the sinuous patterns created by fences around horse farms. Initial concept studies showed a cellular network based on these farms informing the site's layout. Gang also hopes for a pedestrian passage running through the center of the site, possibly housing a sculpture park. Studio Gang has been hired to reimagine a stalled mixed-use high-rise in downtown Lexington, Kentucky. Having languishing through the recession and without financing, the development called CentrePointe may now gain momentum thanks to the fresh eye of the Chicago-based firm responsible for the much-praised Aqua Tower. Jeanne Gang, principal, told AN her office will be preparing several concept plans over the next six weeks demonstrating new design strategies that could guide the future project and attract new tenants and financing. The proposed $200 million tower has been scaled back since it was first proposed several years ago. Current plans call for a 25-story tower with a mix of residential, commercial, retail, and hotel space. Studio Gang will be presenting several scenarios to keep the mix of uses while better integrating the design into the community and attracting future buyers. "There's a definite urban design component," explained Jeanne Gang. She said Lexington can sometimes feel like a commuter city. "We want to get people out of their cars." Beyond making the city more pedestrian friendly, Gang expects to develop strategies to mediate the varying scales surrounding the full-block site. One side of the block offers two- and three-story historic structures while another features larger office towers. Developers drew the ire of the community by razing the block, which once housed small-scale historic buildings. Now that the damage is done, however, the city and developers hope to move forward with a rejuvenated plan. "The site is literally a tabula rasa," joked Gang. "It's sitting there waiting for something good to happen." Gang visited the site several times in March to evaluate site conditions. Her firm is already familiar with Lexington, however. According to the Lexington Herald-Leader, Studio Gang proposed a new Lexington city hall and has been retained to develop a master plan for the University of Kentucky's College of Design. "The area has good bones," said Gang. "There are some really nice historic buildings and two colleges nearby. There's also a very active convention center and basketball arena." She has also drawn inspiration from the horse farms and their prototypical wooden fences surrounding the city. For the time being, the CentrePointe site, now covered in bluegrass, is also surrounded by a similar split-rail wooden fence.